Rollup Data Tables are a way to gather data from multiple levels of child specifications and roll them up into a table in a parent specification. Data is retrieved from Specification Properties in the child project(s). Automatic linking of Specification Properties is achieved via the Child Specification List having a Specification Property with the same name as a Column in the Child Specification List. 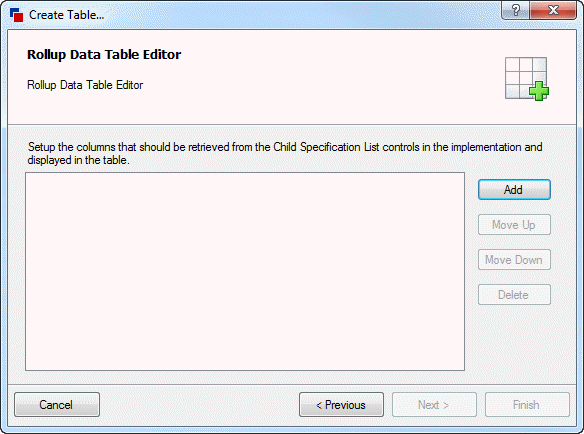 Data needs to be passed from the Specification Property to the Child Specification before it will appear in the Rollup Table. Only data from specifications that are embedded and synchronized will be retrieved. Specifications will only be embedded if the root specification is set to embed child specifications. Specifications will be synchronized if the Child Specification List control that created it is set to continually synchronize with embedded specifications. Select Stage 3: Data and Rules> Define Tables. Click the Add button from the command bar to add a new table. 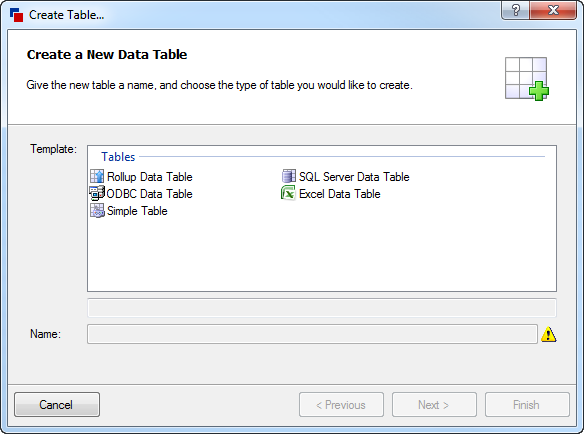 Select Rollup Data Table from the list of tables and enter a name. From the Rollup Data Table Editor, click Add to add a new column. Column names must match the name of a Result Column in a Child Specification List (see Result Columns in the topic Projects), to automatically add the value into the table. Repeat step 6 above for each item that is required to be included in the rollup table. Click Finish to apply the Table. Name - Is the name of the specification the row entry relates to. Type - Is the name of the project the row entry relates to. State - Is the current state of the specification the row entry relates to. Level - Is the level of the specification in the child specification hierarchy that the row entry relates to. Child Specification Control - Is the name of the Child Specification List control the row entry came from. Parent Specification - Is the name of the Parent Specification of the row entry. Row Index - Is the row number of the specification in the Child Specification List control of the row entry. Any other columns are those added manually using the editor. By default Rollup Data Tables will contain no values at design time, as they are populated with specification data. Rollup Data Tables provide the ability to enter placeholder data when editing the table. This ensures meaningful values will be given when building rules that use the table. Select the Rollup Data Table from the list of tables in the Define Tables section. Click the View/Edit button on the command bar. This opens the Rollup Data Table in edit mode. Click in a cell and start typing to enter data into the table. Click OK to finish editing and accept the changes. Column names must match the name of a Result Column in a Child Specification List to automatically add the value into the table.